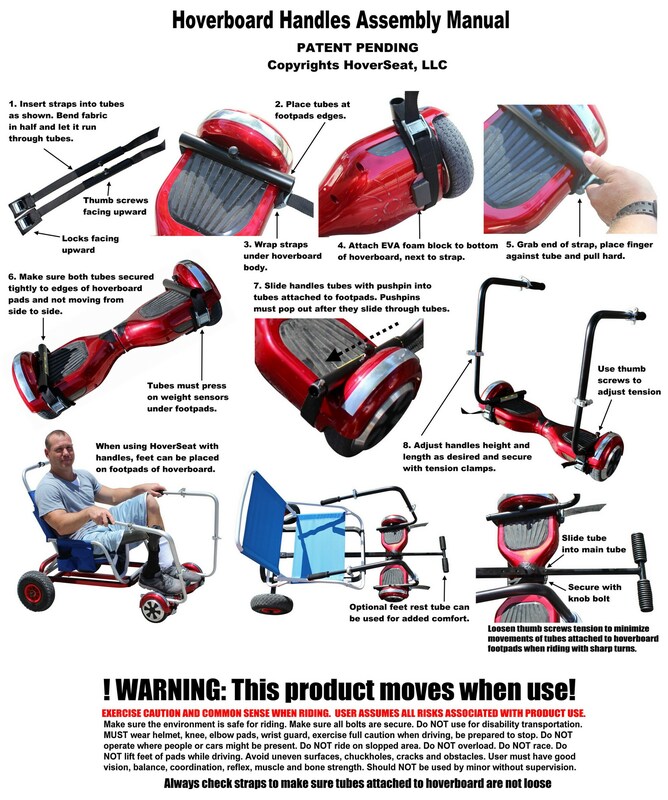 Introducing new product that converts a standard hoverboard into an ingenious hands-free mini electric vehicle! 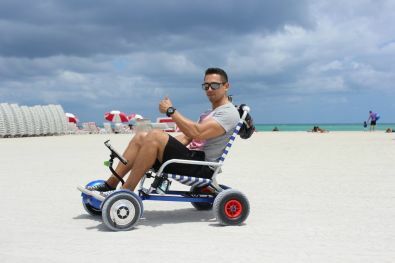 We created patent pending HoverSeat to solve the problems typically associated with hoverboards and we have created a new, fun mode of transport that virtually anyone can drive. 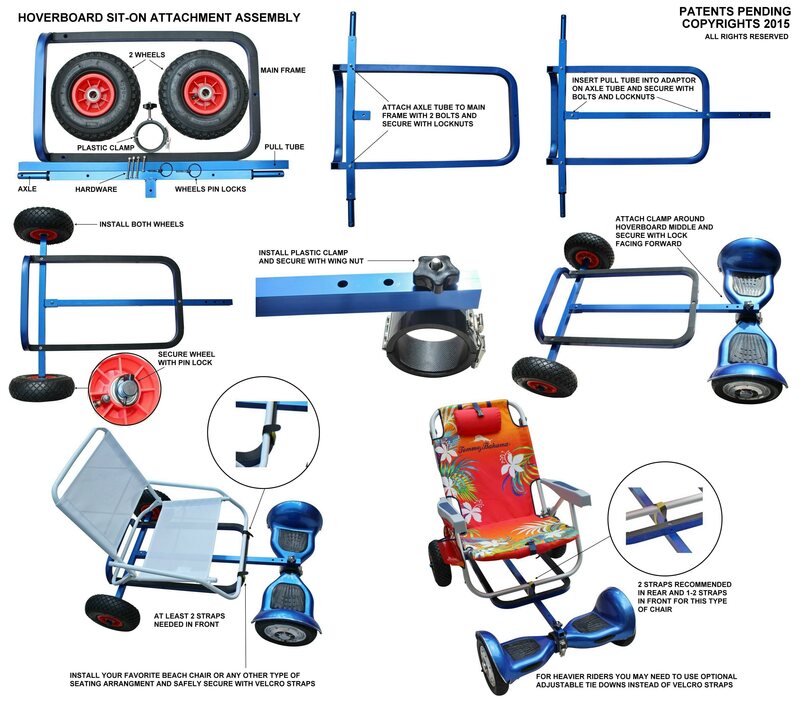 As well as being easy for any age to steer and operate, the HoverSeat is comfortable, versatile and has many practical uses. 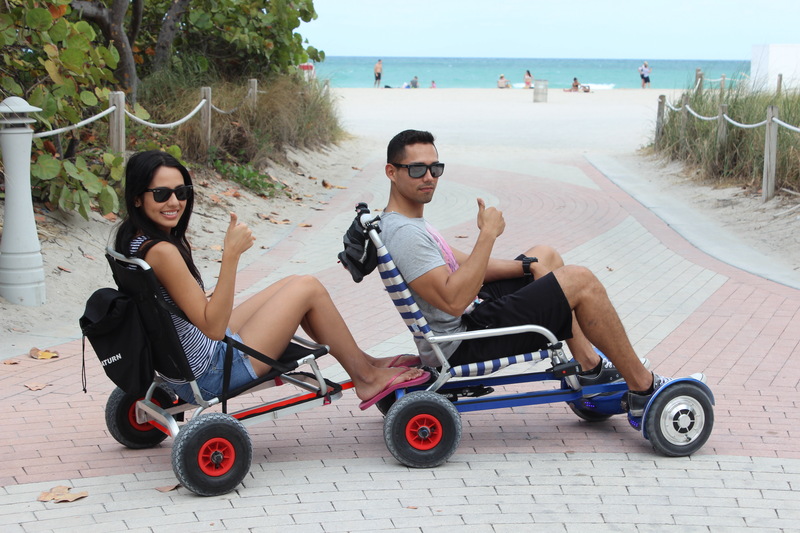 Simple to set up: The hoverboard cart is a light aluminum frame which fits easily in the trunk of the car. When you want to use it, simply attach it to the bar in the center of your hoverboard with the specially adapted clamp - and then choose what you would like to go on top of your unique mini-vehicle. Comfortable: Attach your favorite beach chair to the platform, relax, and drive! Perhaps you prefer a fishing chair, a bicycle seat, a box with a cushion, or something else? Any box or seat that can stand on a flat surface and is strong enough to support your weight can be installed on the hoverboard cart. Attach a cooler box and ride it to the beach! Easy to drive: Navigate the hoverboard using only your feet; it can even reverse. The hoverboard cart can be used on or off-road, and can ride over grass, gravel, and packed sand. Practical: The hoverboard cart is ideal for a cooler box that is strong enough to sit on. Use the hoverboard cart to tow a wheeled cart and then transport bags, boxes, groceries, or a paddle board, or use it to transport heavy or awkward tools. 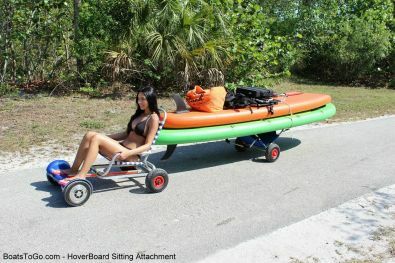 The hoverboard cart is strong enough to pull a kayak down to the beach. No need to carry your hoverboard ever again: Use the hoverboard cart to transport your hoverboard back home or back to the car when the charge has gone. Safer than a hoverboard: No more falling off when the hoverboard hits a crack or bump in the pavement - and sitting is far safer than standing. Aluminum frame with 2 ball bearing wheels and Patent Pending HoverClamp. Beach chair or hoverboard are NOT included. "The hover seat came today and it looks real good! I am satisfied with the purchase!